Dried blood was caked along my arm. I could barely raise my elbow up to a 45 degree angle and my hip joints refused to lift my own leg weight higher than a few inches off the ground. I had a ridiculous grin on my face when I woke up this morning. 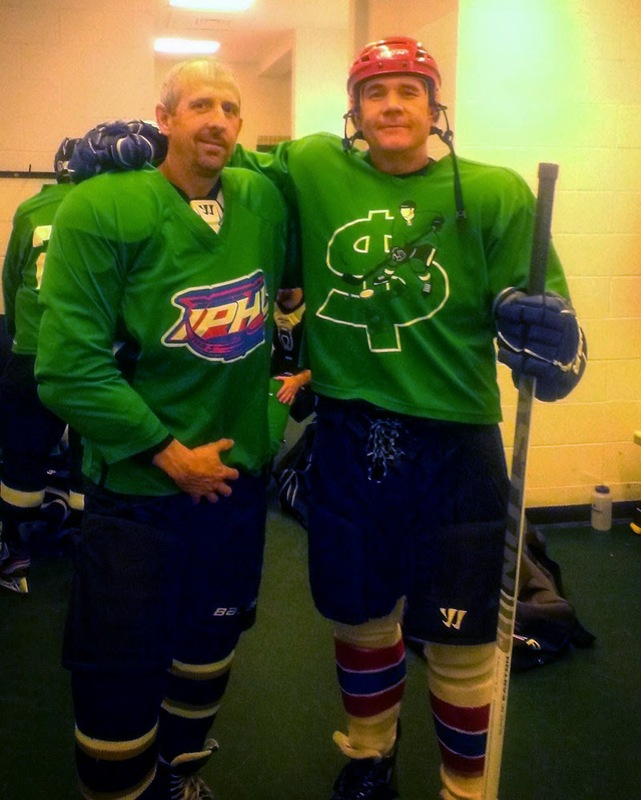 Last night I set aside the pads and blocker and played my very first game as a skater since PeeWee hockey circa 1975. The MONEYSHOTS were 1-10 with just two games left in the season and I asked my team mates if anyone had a problem with me skating out. Nobody did. standing so close to greatness. I spent the week prior to the game gathering up used player gear- hand me downs and castoffs from various hockey friends who helped me piece together what I needed. I decided to try out all this foreign equipment, including the strange objects called player skates, at a Stick n Puck. I was wobbly and didn't dazzle anyone at the local rink but I also found out I could mostly skate around without falling, could handle the puck enough to move it around the ice and had a good enough wrist shot to get the puck up in the air with some force given I wasn't off-balance. Good enough! The next night I'll play. The game was now underway and I'm on my third shift of the night. At left wing I'm playing too deep in our defensive zone and lagging the play when we have a rush but I'm still skating pretty well and trying to get myself into the mix. We move the puck into the other team's zone and there's a battle for possesion near the corner of the net. As I move through the slot, the puck finds its way onto my stick and in a blur I wrist it high blocker side on the goalie. I honestly have almost no memory of the goal beyond a flash of seeing the puck hit the back of the net but I do clearly recall my celebration after. In some weird combination of Rocky-esque air punching and riding my stick between my legs, I whooped and hollered my way across center ice. I had netted my very first goal and screw everything, I was celebrating! My team mates grinned and laughed. 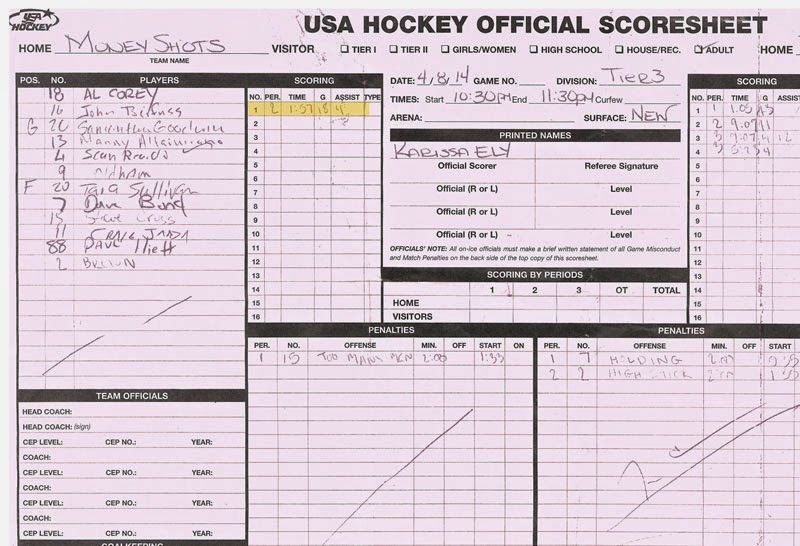 Who the hell gets lucky enough to score in their 3rd shift ever? I had a couple of scoring chances the rest of the game but ultimately we lost 4-1. I felt a little sheepish scoring our team's only goal of the night. I took a hard tumble and landed on my elbow sometime in the second period- nobody had showed me how to properly wear elbow pads. The result was a nasty cut and a bloody jersey. I used muscles I've never used before playing in net and this morning I'm moving around at the pace of a 70 year old. Still I've got a ridiculous grin that won't go away. I don't have any plans to leave my tending behind or even skate out full-time for any of my teams. I guess I just wanted a taste of what it's like on the other side of the scoresheet. I've also gained a greater respect for the difficulty of positioning and the effort it takes to create a scoring chance. That's something that will stay with me between the pipes. Maybe I'll be a little less hard on the guys in front of me. I came back to hockey. 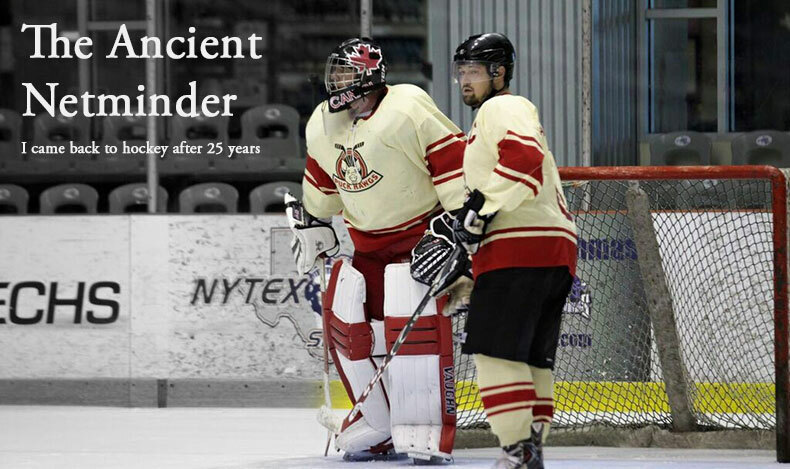 I am the Ancient Netminder. But for one night I was a goal scorer.